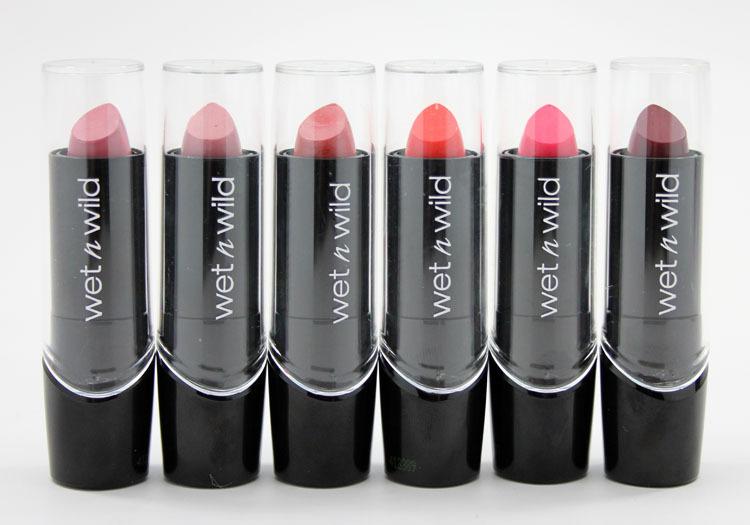 Wet n Wild Silk Finish Lipstick now has six new shades and a whole new formula for the whole line-up for 2015! 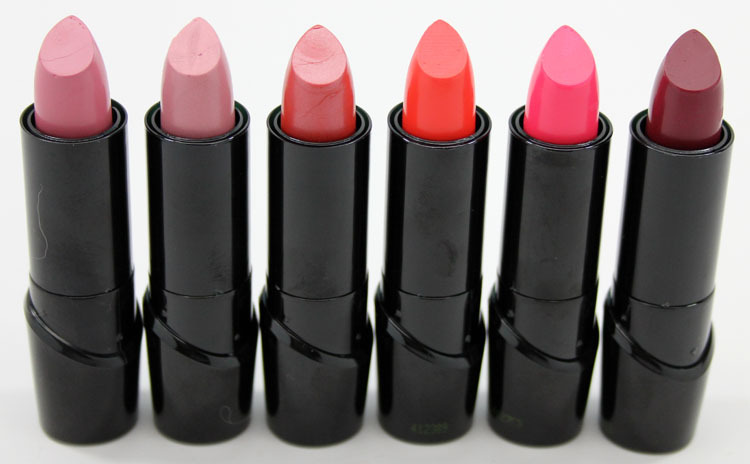 These lipsticks, which contain vitamins A and E and aloe vera now also have macadamia nut oil for even more hydration and anti-oxidants. They have a buildable formula and are really quite comfortable to wear for a long time. They feel soft, glide on easily and are nicely pigmented. There is no taste or smell to note. The one thing I don’t love about the packaging is the way the clear plastic top has to be lined up “just-so” to get it to shut completely. Other than that these are SO WORTH the .99 cent price. I mean really, freakin’ .99 for a good lipstick? Yes please. Will You Be With Me? is a light bubblegum pink cream. A Short Affair is a pale iridescent pink/lilac. Ready To Swoon is a orange shimmer. What’s Up, Doc? is a bright coral cream. 15 Minutes Aflame is a bright pink cream. Blind Date is a medium plum cream. I really like the texture and look of these shades. They are comfortable, saturated (except A Short Affair which is more sheer) shiny and really pretty colors. My favorites are Will You Be With Me?, What’s Up, Doc? and 15 Minutes Aflame. These should be available at retailers CVS, Walgreens, Rite Aid, Target, KMart, Walmart, Duane Reade, etc. in February. See any shades that appeal to you? Is this the same line that was in the silver packaging or a completely new line? Because I’m really digging this new formulation from the swatches alone! Kelly B.´s last post…New Revlon HD Lip Gloss, Review & Swatches! I *believe* so. These are the new shades and then they have the old shades still but in new packaging with a new formula. I think these look like things I already have. They are pretty but I think I’ll pass this time. O_O Coming from the land of $30 Revlon lipsticks, I just can’t even imagine the wonder of getting a good lipstick for 99 c.
For freaking 99 cents, I’ll definitely be trying some of these out. LOL! 15 Minutes Aflame is my favorite on you. These are beautiful! There really isn’t a single one I don’t really like, although I’m not a huge fan of paler lip shades like the first two. These ones are sheer enough, though, that I think I could pull them off. I picked 5-6 of these up for myself and my Mom and they’re great for the price. .99 are you serious! I can’t wait for these. I love all the colors except for Will You Be with Me. I don’t think it would show up on me. Oh yes!!!! Really digging that price point, with all those excellent ingredients!!! WOW!!! I like the last 4 colors!!! They are nice colors, they look really nice on you, loving that dewy, cremey texture too, 😀 and they have nice coverage. Best news is CVS is only 5 minutes away from me!!! 😀 😀 😀 nice review! Thank you! For 99 cents I’d try Will You Be With Me. Even if I hate it it would be fun to try. These look great! I’ll have to keep my eyes peeled for them. I just got 4 of these today! They’re already at my Walgreens. They are fantastic. So worth the 99 cents. I grabbed quite a few of these last week and was quite impressed with them, especially for $0.99!! Amanda Fashion Footing´s last post…New! Milani Fierce Foil Eyeliners! I’m not a fan of the lighter colors but the rest are FREAKIN’ AWESOME! I got the “What’s Up Doc?” and “15 Minutes Aflame”. They are MUCH brighter than shows on your lips. They are practically neon orange and neon pink. I love them! I’m allergic to the new formula. 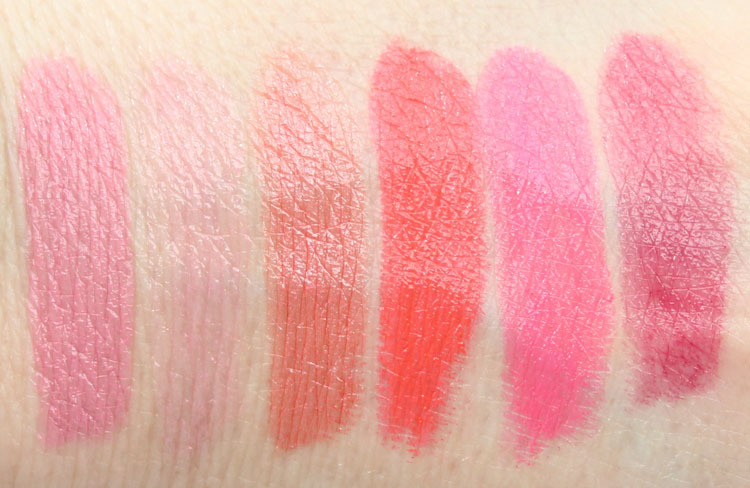 Love the colors, wore ready to swoon for 4 days straight then woke up to red, swollen lips that stayed sore for a week. I wore their old colors for years with no problems, wish they would change it back. I bought two of these at, one in 15 mins aflame and whats up doc? and I just fell in love with these right away! And for .99 cents its hard to beat!